吴斌, 张一, 陈勇, 刘权, 李瑞, 胡冰峰, 方朝晖, 鲁云霞. 丹蛭降糖胶囊治疗肥胖引起的慢性肾病的机制研究[J]. 中国药理学通报, 2018, 34(8): 1163-1169. WU Bin, ZHANG Yi, CHEN Yong, LIU Quan, LI Rui, HU Bing-feng, FANG Zhao-hui, LU Yun-xia. The preliminary mechanism of Danzhi Jiangtang Capsule for improving high fat diet-induced kidney damages[J]. Chinese Pharmacological Bulletin, 2018, 34(8): 1163-1169. Abstract: Aim To study the preliminary mechanism of Danzhi Jiangtang Capsule (DJC) on the high-fat diet-induced injury in kidney of rats. Methods Male SD rats were randomly divided into control diet group (CON), high-fat diet group (HFD), HFD and DJC low dose treatment group (HFD+DJCL), HFD and DJC high dose treatment group (HFD+DJCH). The latter three groups were fed HFD for 12 weeks, then the latter two groups were given DJC 500 mg·kg-1·d-1 and 1 000 mg·kg-1·d-1 via gavage for 8 weeks respectively. The levels of serum lipid and kidney metabolism indices were detected. HE, Oil red O and PAS staining were used to observe the pathological changes of kidney. 10% kidney homogenate was used to detect triglyceride (TG), total superoxide dismutase (TSOD), CuZn superoxide dismutase (CuZn-SOD), catalase (CAT), glutathione peroxidase (GSH-Px), total nitric oxide synthase (TNOS), malonaldehyde (MDA). Expression and distribution of FAT/CD36 were detected using immunohistochemistry. Expression of SREBP1c and FASN were detected using RT-PCR. 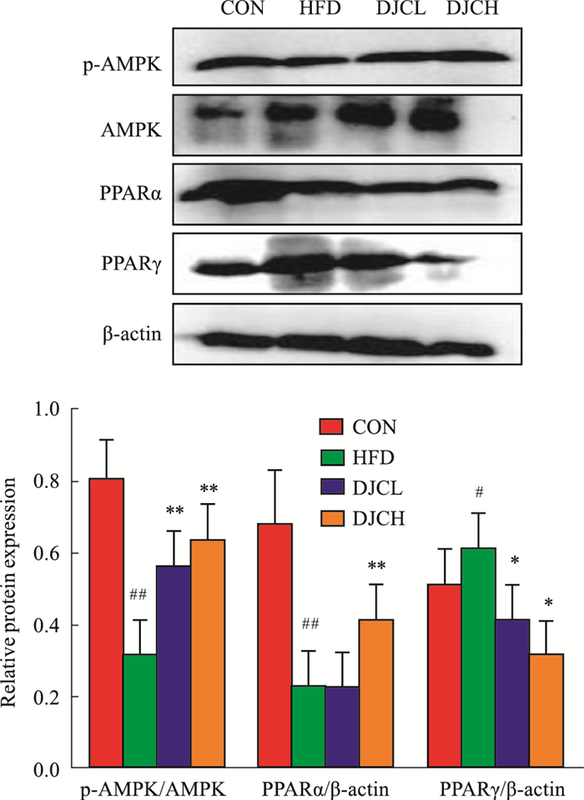 Expression of AMPK, phosphorylation of AMPK, PPARα, PPARγ were analyzed using Western blot. Results Compared with CON group rats, rats in HFD group showed greater weight, higher serum levels of TC, TG, UA, Scr, BUN, and lower serum levels of HDL-C. Obvious injury and lipid deposition were observed in the kidney, GSH-Px and MDA content increased, meanwhile TSOD, CuZn-SOD, CAT, TNOS levels decreased. Expression of FAT/CD36, SREBP1c, FASN and PPARγ increased, while that of PPARα, AMPK and phosphorylation of AMPK decreased. Compared with HFD group, the HFD+DJC groups showed significantly improved above indices in a somewhat dose-dependent manner. 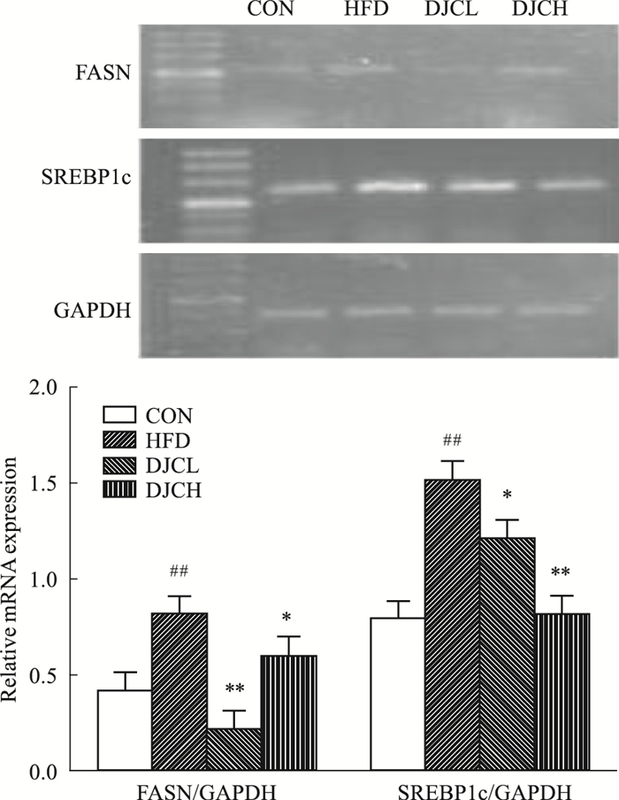 Conclusions DJC effectively reduces HFD-induced lipid deposition and oxidative stress in kidney, and the mechanisms are possibly related with activated AMPK-PPARα signaling and decreased expression of CD36 and lipogenic genes PPARγ, SREBP1c, FASN, exhibiting a dose-dependent effect. 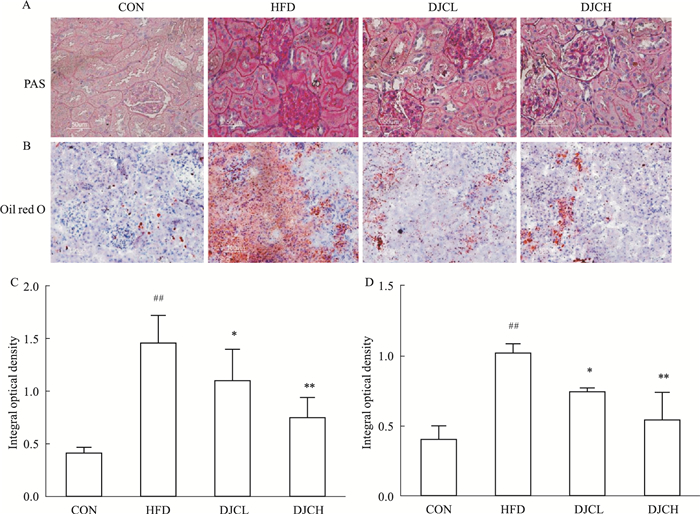 Fig 2 Effect of DJC on pathological changes in kidney induced by HFD(HE staining, ×400) A: Control diet group; B:HFD group; C:HFD and DJC 500 mg·kg-1·d-1 group; D:HFD and DJC 1 000 mg·kg-1·d-1 group. Fig 3 Effect of DJC on pathological changes in kidney induced by HFD(×400) A: PAS staining of kidney; B: Oil red-O staining of kidney; C: Quantification of PAS staining; D: Quantification of Oil red-O staining. ##P < 0.01 vs CON group; *P < 0.05, **P < 0.01 vs HFD group. 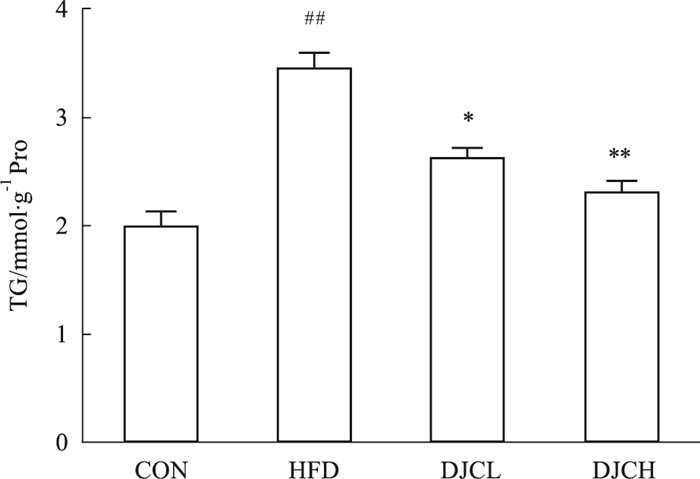 Fig 4 Effect of DJC on expression and distribution of FAT/CD36 in kidney by immunohistochemistry(×400) A:Control diet group; B: High-fat diet group; C: HFD and DJC 500 mg·kg-1·d-1 group; D: HFD and DJC 1 000 mg·kg-1·d-1 group; E: Quantification of immunohistochemistry. ##P < 0.01 vs CON group; **P < 0.01 vs HFD group. 程龙艳, 贾会玉, 陈光亮. 丹蛭降糖胶囊治疗2型糖尿病实验与临床研究进展[J]. 中医药临床杂志, 2014, 26(8): 870-2. Cheng L Y, Jia H Y, Chen G L. Progress in experimental and clinical research of Danzhijiangtang Capsule on therapy of type 2 diabetes mellitus[J]. Clin J Trad Chin Med, 2014, 26(8): 870-2. 陈明卫, 夏同佳, 方朝晖, 等. 丹蛭降糖胶囊改善高脂饮食诱导的肥胖大鼠骨骼肌胰岛素抵抗机制的初步研究[J]. 中华临床医师杂志:电子版, 2014, 8(9): 1697-702. Chen M W, Xia T J, Fang Z H, et al. Experimental research on mechanisms of Danzhi Jiangtang Capsule in the improvement of skeletal insulin resistance in obese rats fed with high-fat diet[J]. Chin J Clin (Electron Ed), 2014, 8(9): 1697-702. 李艳, 卜文婕, 朱建梁, 等. 丹蛭降糖胶囊对糖尿病大鼠肾脏的保护作用[J]. 中国药学杂志, 2015, 50(10): 857-62. Li Y, Bu W J, Zhu J L, et al. 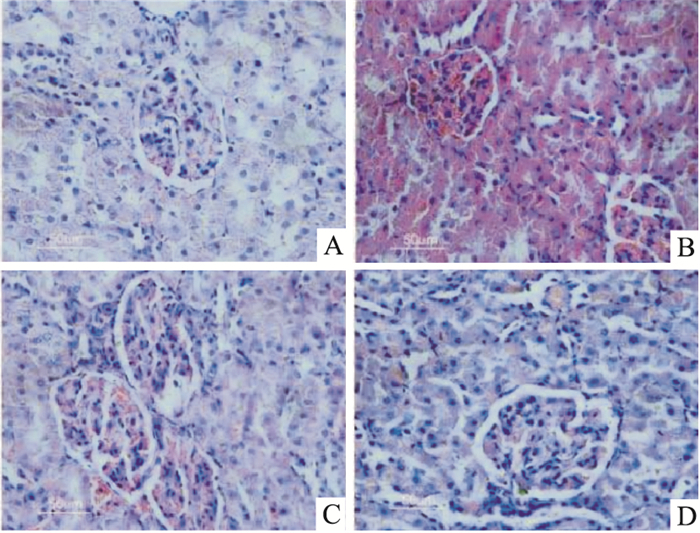 Nephroprotective effect of Danzhi Jiangtang Capsule on diabetic rats and its mechanism[J]. Chin Pharm J, 2015, 50(10): 857-62. Sun M, Li Y, Bu W, et al. DJC suppresses advanced glycation end products-induced JAK-STAT signaling and ROS in mesangial cells[J]. Evid Based Complement Alternat Med, 2017, 2017: 2942830. 孙乐, 贺震旦, 杨润梅, 等. 粗壮女贞总苷降脂作用及其基于AMPK通路的降脂作用机制研究[J]. 中国药理学通报, 2017, 33(8): 1073-9. Sun L, He Z D, Yang R M, et al. Hypolipidemic activity of total phenylpropanoid glycosides from Ligustrum robustum(Roxb. )Blume and its mechanisms on AMPK pathway[J]. Chin Pharmacol Bull, 2017, 33(8): 1073-9. Chinese Pharmacological Bulletin, 2018, 34(8): 1163-1169.